Tomelia repairs all brands of sails. Contact us and let’s talk about how we can service your sails. We can give you the benefit of our years of experience and discuss the method and worth of the sail repair as well as the cost involved. The price for sail repair work is based on the time and materials needed to preform the work. Our labor rate is $90 per hour, this applies to inspections, as well as actual repair work. 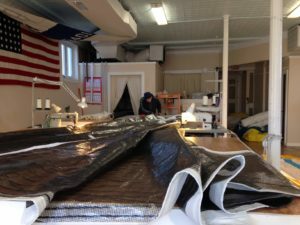 A sample of the sail repair services we offer. • Conversion to full lengths battens. • Sun-covers restitched, replaced, or removed.